Rinse a cup of quinoa in a mesh sieve/strainer, drain, and allow to dry on a few sheets of paper towels. Drying time will vary, I usually rinse, strain, and just walk away. Once dry, toss quinoa into a pot and allow it to toast on medium heat for just a minute or so, while stirring. You don't quite want to brown it, just a light toasting. Next add 1.5 cups of water [or chicken/veggie broth!] to your quinoa and bring to a boil. Once the bubbles start flying, reduce to low, cover, and simmer for approximately 12 minutes. Remove lid, fluff with a fork, and set aside. If it's still a little liquid-y let it simmer for another minute or so until it's nice and fluffy. 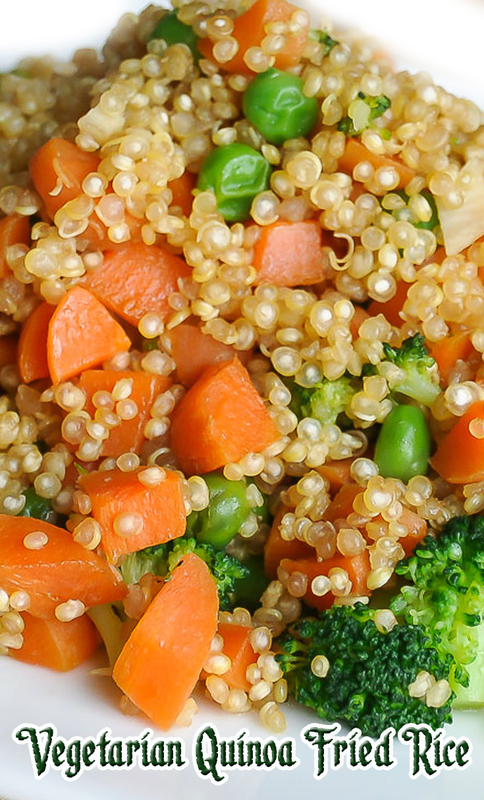 While you're waiting for the quinoa to simmer to fluffy perfection, prep your veggies! I used frozen peas, fresh baby carrots, and fresh broccoli since it's what I had on hand. Any combo of veggies, frozen or fresh will work! To get them all ready for frying, I blanched (boiled) chopped broccoli florets, diced carrots, and whole peas in about an inch of water in a small frying pan. Cook the veggies until tender and drain. Add your butter/oil and garlic into the skillet with the veggies and stir frequently. By now the quinoa should be ready... toss it into the skillet with the veggies along with your soy sauce. If you're adding egg, crack one over the side of the skillet while it's still hot and fry it up into your yummy quinoa fried rice. Season to taste and pan fry for a few more minutes. Serve hot with a side of soy sauce an sweet chili sauce if you have it!